As our daughters enter into womanhood, first through menstruation then sexual activity, they are presented with many different options for both birth and period control. Lybrel is a no-period birth control pill. It is the first low dose birth control pill designed to be taken 365 days, without a placebo or pill-free interval. Seasonale has 12 weeks of estrogen/progestin pills, followed by 7 days of no-hormone pills — which means 4 menstrual periods a year. Seasonique has 12 weeks of estrogen/progestin pills, followed by 7 days of low-estrogen pills — which results in 4 light, short periods a year. It is similar to Seasonale but has 7 days of low-dose estrogen instead of placebo pills. Yaz is a less-PMS pill. It has a 28-pill monthly pack — 24 active pills and 4 inactive pills. Your monthly cycle is shorter, lighter, more regular. Beyaz is similar to Yaz but with a form of folic acid added to prevent birth defects should a woman become pregnant. But what does pharmaceutically induced period suppression do to our young daughters? Ovulation is not just about making a baby. It’s also the main hormonal event in a menstrual cycle, and the only way to make estrogen and progesterone. When we shut down ovulation with hormonal birth control, we rob girls of the hormones they need for metabolism, bone health, cardiovascular health, mood, and more. Girls who take synthetic pseudo-hormones via the Pill lose the ability to produce their own hormones. Pseudo-hormones have some similarities to real human hormones, but they also have many differences. For example, the progestin levonorgestrel causes hair loss, but the body’s own progesterone stimulates hair growth. The progestin drospirenone increases the risk of blood clots, but progesterone improves cardiovascular health. Ethinylestradiol, the synthetic estrogen in the Pill, impairs insulin sensitivity , but estradiol improves it. These synthetic hormones do not have the health benefits of the human hormones they replace. Hormonal birth control is often prescribed to “regulate” periods, but that is nonsensical because a pill-bleed is not the same as a real period. A real period is the end result of a series of important hormonal events including ovulation. In contrast, a pill bleed is a withdrawal bleed dictated by the dosing regimen of the drug manufacturer. 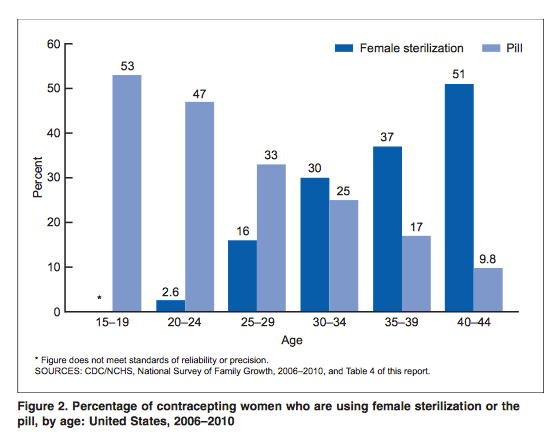 According to the US Centers for Disease Control and Prevention, 50% of young women under the age of 25 are on the pill.5)http://www.cdc.gov/nchs/data/nhsr/nhsr060.pdf That is 1.6 million young women who are putting themselves at risk from menstruation reducing or suppressing birth control. What are we teaching our daughters? What is your relationship to your cycle? Is it really something you wish to get rid of all together, or do you look forward to this monthly visitor as a reminder of your connection with fertility and the lunar cycle? We need to teach our daughters to respect their natural body, including their cycles. 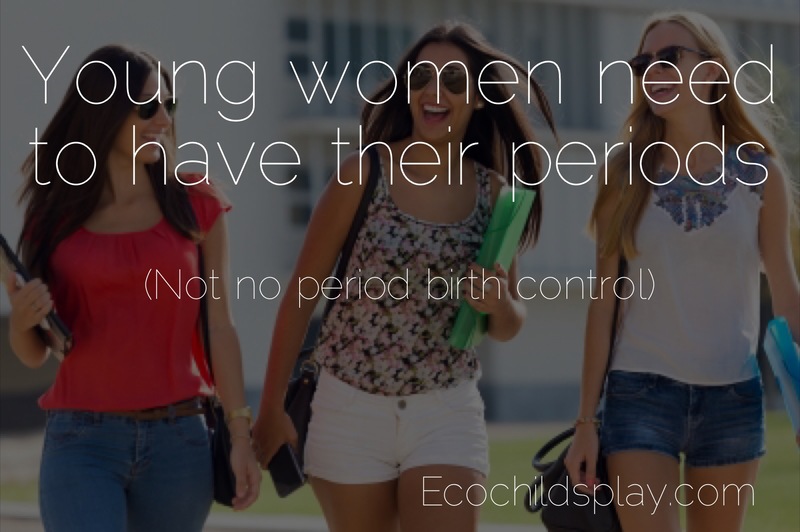 We need to teach them about menstruation, its purpose in reproduction, and its role in natural hormone production. We need to teach our children different methods of birth control. The menstruation suppressing pharmaceutical pills are not the answer. « Are dangerous parabens lurking in your beauty products?